"The automotive industry has lagged behind" in adopting social media, according to a blog by Fast Company community contributor JD Rucker. Really? Slow compared to what other industries? Tech? Well of course the tech industry is going to be the first to adopt social media, because they create the tools that make up social media. But hasn’t the clothing industry been slow to adopt social? Or the airline industry? Or the restaurant industry? I’m just not sure why this author is so quick to slam automotive for being slow to adopt, when in fact the auto industry has been very active in the space for some time. Auto companies have been engaged with blogs and forums for quite a long time. One of the earliest successes of corporate blogging is General Motors with their Fastlane Blog. In fact, back in 2006 when one of the first corporate blogging books came out from author Debbie Weil, GM was prominently featured where Bob Lutz shared, "I just love getting the direct, unflitered feedback. But I also love radiating my personal opinion." Back then, GM had over 10,000 customer comments a major feat for any brand back then. Jeep is a brand that has been at the forefront of engaging in user forums, communities and blogs. I remember back in early 2000 how Jeep was regularly working with bloggers and forum administrators on getting them to Jeep events and firing up the brand’s owners through social outreach long before any of us called this stuff “social media.” Jeep engineers did chats with forum members through round table discussions and paved the way for demonstrating social outreach, now many brands host consumer chats giving access to people inside OEMs. And what about social community sites? Facebook has been a hot bed of innovation from automotive brands as Ford launched a widget for Sync back in 2007, Saturn had their I am Saturn widget in 2007, and Scion had a widget in 2008. Now there are Facebook applications across several brands in the social space over the past couple years from the Ford Fusion Speak Green app, Everybody Loves a Honda app, and Meet the Volkswagens. These are just a few and there are many, many more. Sure these are marketing efforts but they engage brand loyalists and others to attract them to brand fan pages. Automotive fan pages do engage fans through interaction with the brand via communication of news, events and other forms of outreach. As someone who regularly watches this space, I see examples every day of brands talking to consumers on fan pages and facilitating discussions. Automotive has been engaged and continues to learn, like many industries, how to make this space more effective for consumer opinion, customer service and influence to sale. Some brands have even taken very active steps to establish their own social communities. Here is an article I did highlighting several examples from Saturn, Mercedes and Hyundai. The Fast Company blogger overlooks how a lot of brands, across many industries, have been slow to adopt Social Media. In fact, I’d argue most industries, outside of those in the technology field, have been much slower than automotive in this space. What’s strange about Rucker’s article is that he should know better. He is currently the Chief Marketing Officer for TK Carsites, a company that helps dealerships with search engine optimization (SEO) among other things. Perhaps his knowledge of OEMs and purchase cycles is not as strong has his involvement with dealer marketing? Unfortunately, his article misses how pervasive the industry has been in the social media space. Sure not every brand instantly created a Facebook fan page, started a Twitter account on day one, talked to bloggers five or ten years ago, but neither has any other industry and just like other industries, various brands have been engaging in social media in a multitude of ways through the years. 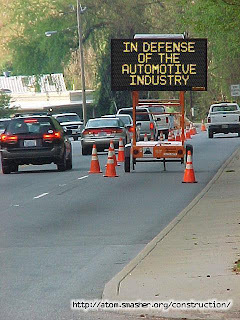 I’d argue the automotive industry has been a leader that many industries have followed, not the other way around. So, Is the Article Right About Dealers? As I just demonstrated, the brands have made a strong play in social media over the years, but what about Rucker’s argument about the more customer facing segment of the industry – dealers? 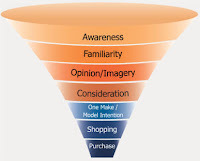 Purchase cycle from consideration, research, and purchasing is much longer than most purchases. Cars are considered purchases and take around 6-9 months on average, according to CNW, a leader in automotive marketing purchase behavior research. Social media is designated as an awareness play by the manufacturers because it’s a great way to get people talking about your products early and may lead to interest through word of mouth in online communities and social communication. For dealers, the question is more convoluted. Many dealers I’ve talked to are concerned about the amount of time it takes to turn engagement into a sale and feel other methods like email marketing and SEO have better Return on Investment results. Plus as Rucker should know, Internet Managers at dealerships are quite busy already handling email leads and other activities that make being regularly engaged on Twitter and Facebook hard to find time for. Many brands I have worked with have made recommendations to dealers about social media engagement. Manufacturers can’t force dealers to do social media, but they can educate and it’s promising as social media gains notoriety that brands and dealers are actively talking about what works. Could they talk more? Of course, but it is happening with many brands. It does sound like the new partnership TK Carsites is part of should help dealers get better in the social space and I’m sure Rucker’s expertise in this area is very valuable for those dealers willing to invest. And like a lot of industries, the investment will lead to some solid examples others are sure to notice. The article makes a few recommendations at the article’s end. Let’s take each one-by-one. Social Networks and Blogs: The author makes a typical assumption here, but I’d argue, as would most experts on corporate blogging, that not every company should do a blog. What you have to do is determine if your company’s culture and leaders are right for engagement and if it is best for your brand to start a blog or instead engage with bloggers (of course many do both.) But there are lots of corporate blogs around from companies like Subaru, GM, Chrysler, just to name a few. Social Network Engagement: Just about every automotive brand is on Twitter and Facebook in various capacities. Just like any industry, some companies are doing better than others. Ford, Toyota, Honda, Hyundai and GM really stand out on Twitter. Jeep, Ford, GM, Honda, and BMW stand out on Facebook. Of course, engagement is key here and all brands are figuring it out still. Automotive is definitely not behind as an industry and brands are very actively engaging with consumers, advocates, and critics. Videos: Auto manufacturers have long been producing videos online that share how products work, showcase new technologies and educate consumers on many levels. I’m not sure what Rucker searched for when browsing the web or YouTube but much of his recommendation is already massively available online and growing every day. Search for Customers on Social Media: This is happening too, but like other examples I’ve shared above, it is happening in pockets. Of course, everyone could be much better at this; however, there have been significant changes already showcasing some great examples. One of my favorites is the @VolvoXC60 Twitter account that regularly engages with Volvo considers and owners. They are not doing customer service online but they are reaching out in the car-shopping experience, as are other brands like Ford and GM. I think JD Rucker probably knows most of what I’ve laid out here as he has a pretty decent blog called Soshable covering automotive and social marketing. I’m sure his article had more to do with lighting a fire under a few companies or dealers who are slow to adopt and hopefully drum up more business for the partnership he mentions. My issue is that articles like Rucker’s do a disservice to the industry and further propagate the illusion that the automotive industry is not active or innovative in social media. Hopefully, I have demonstrated here a defense for an industry that is very engaged in social and will continue to show other industries how to do it. For some reason Social Media sounds so 2009, and the end of the first decade of the 21st Century. For 2010 its should be "Social Networking" is a better description of what will transpire. Human beings have been "networking" for thousands of years in one fashion or another. Technology is constantly empowering how humans network with each other. Auto manufacturers have been "networking" with customers for years in one fashion or another, and dealers have been doing the same. The Internet disseminated the product information, the showroom migrated to the home or office of the customer. Social Networking is inexorably creating a "conversation" channel among customers, pundits, analysts, dealers, in addition to the product information. Are dealers behind, if dealer are waiting for some sort of "social network system" similar to a DMS, CRM, system...yes they will be left in the dust. How many employees in a dealership communicate with customers on a daily basis? From which departments, sales, service, parts, accounting, management,to name a few. Is there a system that will control and manage the social networking? If manufacturers network at large to expand the level of product awareness. Dealers network socially in their trading area. Technology is facilitating the social networking that dealers can do in their targeted trading area. I think you are definitely on to something with dealers (and many other sales people in retail industries) who want some kind of tool that reduces the time all this networking takes. I would venture to guess that companies like TK Carsites feel they provide services to simplify things and I'm sure they do. As you know, social networking takes a lot of time and effort and turning that conversation into a sale on a highly considered, long purchase cycle product like a $30k car is not for the faint of heart and that there are some other methods dealers can use to increase conversion effectiveness using other tools like email marketing. I'm not saying dealers shouldn't give social media - sorry networking - a good try and consult with companies who have proven methods, but to call the "automotive industry" a laggard in social media/networking/whatever the term is in Twenty-Ten is not grounded in fact. That is mainly my point here, not that the industry can't improve or do more just that we are doing a lot, so let's not short change an entire industry. I think the Auto Industry has done well in the Web 2.0 arena. Some better than others clearly. Fords at the top of my list. I have worked with dealers in my market to help them get on board, but the biggest issue is as you said, time. Without the correct ROI measurements GMs and Dealer Principles will not dedicate the time. It's no different from when we started taking photos of used vehicles. Dealers didn't see the need for more than 1. Now I'm fighting them on needing 50+. The retail side will come around, but it will take a few innovators first. They are out there now. Great blog BTW, for some reason I've never been on here. Thanks for stopping by. Excellent point on how we tend to go through these learning curves every time something new crops up like pictures on a web site or does my dealership need a Facebook page. Chris, I see your point. Our space has rapidly shifted to the digital domain — Honda Canada doesn't even print brochures any more! We are well aware of these sites, engagements, and attempts by both OEMs and dealers, because we're in the industry and are on the bleeding edge. site or forum? Nope. Have any of my friends who have recently purchased vehicles been engaged by an OEM or dealer? Nope. We know that people don't need and won't wait for the auto industry to get into a space relevant to their needs, and we know the laggards get left behind. I see true social networking (thanks, Tino!) as an effort that stretches in one line, on one site, from product to dealer, to parts and servicing, to fan forums and social widgets. To your post, I agree, but all of the examples you've mentioned speak to one specific aspect of the auto experience, and I'd argue that few or none speak to real customers who would benefit from frequent interaction. I get your point about some anecdotal evidence that OEMs and dealers are not engaging their customers in social media or digital properties. Actually, when I look at studies we do around digital strategy, social media is affecting automotive consideration and yes some is just social word of mouth conversation, but some is driven by marketing and outreach to owners. It's not much different than other industries but social is having a minor impact on being part of what drove consideration to a purchase. Most owner digital outreach comes after the sale by OEM owner communications, as some dealers (not sure % of how much) are still apprehensive about recommending boards or forums because they fear a bunch of DIY people on there cutting into a dealer's service business. Also you use a Mercedes-Benz example, I have a BMW example where the dealer pointed me and another friend (non-enthusiast) to the owner site to see how our cars were going since both were custom orders and BMW's website provides updates. I'm not sure how M-B is with their follow through and it may vary by dealer which seems common across brands. I definitely agree there is a lot of work to be done. When I worked doing digital marketing for GM, we developed a very engaging and consumer focused set of owner sites. They were promoted very strongly to all customers and we even included some owner forum content areas to as well as service and bill pay. That was 3 years ago. Most brands do a lot of that now and some brands were ahead of GM then. The point is that brands do engage in this space more than the industry gives credit for and like I said in the article, there's always massive room for improvement and more engagement. * Companies advertise there product and websites in blog which will lead to increase sale of the firm. * New dealers who have lack of knowledge about how to run a dealership smoothly can read good blogs about techniques, ways to improve dealership. * Customers really find easy to search there automotive and other needs. Thats y i say blogs are really important for automotive sector to boom. I feel with social media targeting large audiences, this is the best medium to reach towards our niche. Many automotive companies have started making their own communities on social media. Communities can be engaged by offering them company information and products. Some of the companies are trying to solve their consumer problems through these communities. A few days late with my response. OK, months. The new way of promoting company products is a combination of blogging and social networking. Knowing this to is a great edge against other companies.